Recently renovated, the Meadow Course is pure country club, the kind of golf course members enjoy playing day after day and visitors return to year after year. Its occasionally tight fairways, numerous bunkers and lakes provide an ever-changing set of challenges. The creativity and integrity of the Meadows' design unquestionably inspire repeat play and the oft-heard chant, next time. Boasting 6,913 yards, it has the length to test the best golfer's distance. Even its advanced tees offer challenge as seen in handicap ratings which range from a 73 at the Ladies' Tees to a 73.3 at the Championship tees. There's plenty of challenge here and a consistent demand for length, accuracy and playing strategy. 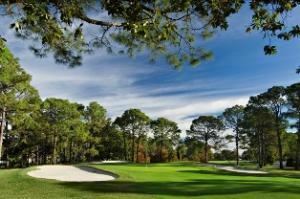 The Bay Point Resor Golf Club is the perfect spot for golf tournaments and corporate outings in northwest Florida and the Florida Panhandle. Special Features: Our best feature is our location! The resort is located in the Florida Panhandle off of St. Andrews Bay, minutes from the sandy white beaches of Panama City - only 20 minutes to the Panama City airport. The Shrimp Boat Restaurant is located in Historic St. Andrews on the St. Andrews Bay. We offer a private Banquet Room upstairs that can accommodate up to 150 people, as well as a Private Dining Room downstairs with Bay side access for more intimate events of up to 50 guests. We can also host events in our uniquely rustic House of Bourbon with wood floors, a built in stage, a copper top bar, and a custom whisky bottle chandelier, with a second story view of the sunset over St. Andrews Bay. Lastly, Barefoot on the Bay and Oyster Bar is located on the back side and offers a fun, colorful, and casual event experience with a covered and open air deck located on the very edge of the water for an uninterrupted view of St. Andrews Bay! We can also Cater your event to taste and are happy to offer creative alternatives to our existing menus. Please contact us today to discuss your next Catered Event! One Thirty One is a historical building with a unique architectural style, located in downtown Panama City. It is an inspiring environment for events large or small. From wedding ceremonies, rehearsal dinners to corporate events, fashion shows and holiday parties. A single level, naturally lit event hall designed for optimal convenience and versatility. Design elements include acoustical wall paintings, antique chandeliers, floor level curtains, stunning 18 feet high ceiling, soaring bright skylights, gleaming hardwood floors and authentic brick walls. Take a break from the normal hotel banquet rooms and host your next event in an engaging and inspiring venue. Well equipped and with access to full catering makes One Thirty One a simple and smart choice.